Welcome to Just Ahead’s Sequoia and Kings Canyon Trip Planner—our guide to what you need to know to plan your trip to Sequoia and Kings Canyon National Parks. Click here to see the complete series—and be sure to download our Just Ahead smartphone audio tour of Sequoia and Kings Canyon before you leave. We’ll steer you to and through the parks and point out their inspiring viewpoints and scenic wonders—plus we share entertaining and educational stories all along the way. It’s like having a friendly tour guide along for the ride. Sequoia and Kings Canyon National Parks—two adjacent parks that are managed as one unit—rise from the rolling foothills of central California to the heights of the majestic Sierra Nevada mountains. Both parks are open year-round, but much of the land is high in the Sierra Nevada, so expect some seasonal road closures. Be sure to check the park’s website for the latest info. Winter, of course, has its own beauty and charm, and you’ll find lodging and even some campgrounds open no matter when you visit. What Are the Best Sights to See in Sequoia and Kings Canyon? This post is part of Just Ahead’s Sequoia and Kings Canyon Trip Planner—our guide to what you need to know to plan your trip to Sequoia and Kings Canyon National Parks. Click here to see the complete series. 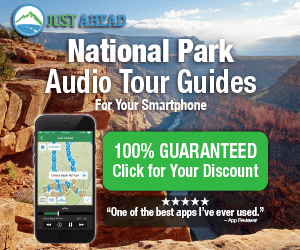 And be sure to download our Just Ahead smartphone audio tour of Sequoia and Kings Canyon before you head to the parks. Sequoia National Park and Kings Canyon National Park are renowned for the world’s most massive trees, which thrive in both parks. But the parks comprise more than giant trees. They’re filled with amazing viewpoints, geological marvels, American Indian petroglyphs, lakes, rivers, meadows, and caverns. Following is our personal list of don’t-miss sights in the parks. Naturally, Just Ahead’s Sequoia and Kings Canyon audio tour guide carries you along some of the country’s most spectacular roads to these sites and more. The General Sherman Tree—world’s largest tree. No visit to Sequoia is complete without paying homage to the world’s largest tree, the General Sherman. It stands 274.9 feet tall, has a circumference of 102.6 feet, and a diameter of 36.5 feet. Consider this impressive stat: At 180 feet above the ground, the General Sherman tree still has a diameter of 14 feet. The General Sherman is the centerpiece of a grove of majestic giant sequoias. 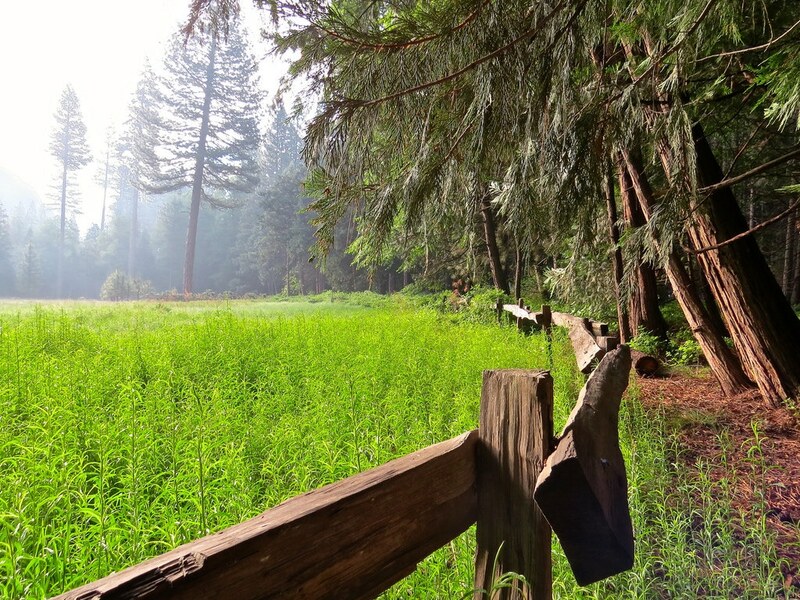 You can feast on plenty more by walking the two-mile Congress Trail, which begins at the General Sherman. Along the way are the Chief Sequoyah and the President—third-largest tree in the world. In many national parks, you have to hike a long distance to see ancient rock art, and even then you may not find it. Park rangers, fearing vandalism, are often reluctant to share precise locations. But in Sequoia, Hospital Rock, a giant boulder decorated with crimson-colored paintings, is right beside the road (Generals Highway)—you can just drive up and have a look. As with so many rock paintings, no one knows exactly who painted them or what they mean. It’s fun to speculate—some look like humans, others like animals or stars. The rock is on the site of a 19th-century Potwisha Indian settlement, but the paintings were probably not the work of the Potwisha, but rather that of earlier native people. Where Should I Stay in Sequoia and Kings Canyon? Sequoia and Kings Canyon National Park lodging ranges from signiture inns in both parks to simple cabins. You’ll also find some private accommodations near the heart of both parks, as well as options just outside the parks. 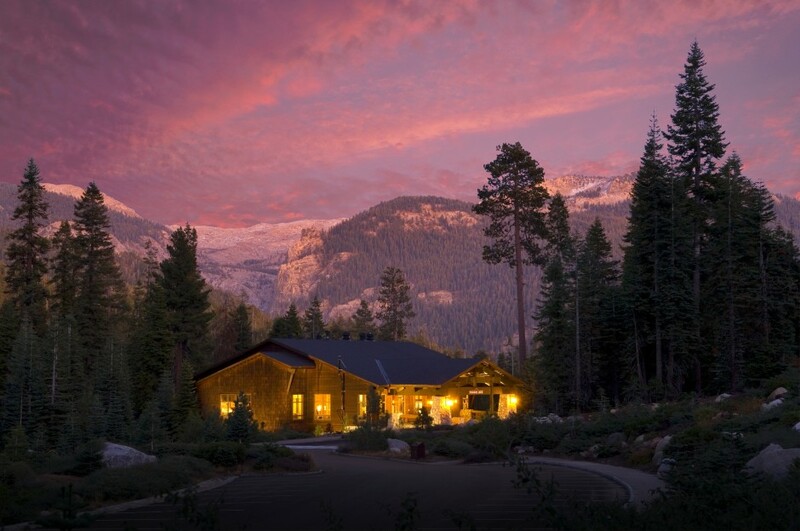 With its stone-and-cedar construction and dramatic view of the Sierra Nevada, Waksuchi has the feel of a classic national park lodge, yet it’s thoroughly modern—built in 1999. The 102-room lodge is near Giant Forest in Sequoia National Park, yet enjoys a quiet, secluded location just off Generals Highway. It’s open year-round. The cedar-paneled main lodge building has a restaurant with huge picture windows and a excellent little shop that sells outdoor gear as well as souvenirs and various necessities. The main lodge also offers free wifi. Where Should I Camp in Sequoia and Kings Canyon? Sequoia and Kings Canyon National Parks have 14 campgrounds, most of which are first-come, first-served; no reservations. A few accept reservations through recreation.gov. Most of the campgrounds accommodate RVs, but none of them have RV hookups. Campgrounds provide storage lockers to protect your food from bears and other hungry park creatures. You’ll also find camping in Sequoia National Forest and Giant Sequoia National Monument, both of which are adjacent to the parks. Tucked away in the far southwest corner of Sequoia National Park, this 10-site, tents-only campground is fairly isolated and has no potable water from October to May. It sits at 3,600 feet, meaning it’s more oak habitat than evergreen. But it’s open year-round and may have a site when others are full. Potwisha lies in an oak-shaded setting in Sequoia National Park on the Middle Fork of the Kaweah River. As the lowest campground in the park (2,100 feet), it’s likely to be the warmest as well, at any time of year. It has 42 sites, some of which can be reserved year-round through recreation.gov.